On Bank Holiday Monday (5th May) I organised the ‘Warming of the Chair’ – the Declaration of the Bardic Chair of Hawkwood, as part of their lovely annual Open Day – when the Gloucestershire College (dramatically-situated on the Cotswold Edge) opens its doors to the public and gives folk a taste of what is on offer throughout the year, with free taster workshops, stalls, walks, demos, delicious food and entertainment. Hawkwood was originally called The Grove, and there is the possibility that once an avenue of yew trees led to the ancient spring which still bubbles there, these days at the foot of the massive sycamore tree. It has been a centre for holistic, creative endeavours and kindred-spirit gatherings for decades (and perhaps even longer, going by its old name) so it seems the perfect place for the location of a Bardic Chair, which is traditionally sited on a Gorsedd mound. The idea for the Bard of Hawkwood came to me through a conversation with Richard Maisey – who interviewed me for the Five Valleys Directory just after I moved to Stroud. He mentioned he had in his possession an original ‘Bardic Chair’ – from a Welsh Eisteddfod. It turns out this precious family heirloom was passed down through the Welsh side of his family and was made for the 1882 Denbighshire Eisteddfod (as the plaque on it states). Having founded the Cotswold Word Centre (CWC) at Hawkwood College last Autumn, I thought the title of Bard of Hawkwood would create a great platform for promoting the good work of the College, the CWC, and the local community. And the Open Day seemed like the ideal day to do it. With the blessing of the Principal Alicia Carey and Education co-ordinator, Katie Lloyd-Nunn, I set to work. I invited fellow Bards to help in the ‘Warming of the Chair’ – a year and a day in advance of the actual contest – each contributing their ‘bardic bottom’ to the proceedings! In the end there were eleven of us – the first eleven as it were – who came out to ‘bat’ for ‘Bardic College’ on a fine sunny day at the start of summer, wearing our finest clobber. I dusted off my Irish Piper’s cloak for the occasion. It was a bit touch and go as the key people didn’t turn up until 1pm – when we were due to start – but it all came together at the last minute. We processed onto the lawn before the May Pole, forming a half-circle around the Chair. Then John Xzavian, Bard of May Hill, blew his horn to announce the start of the ceremony. 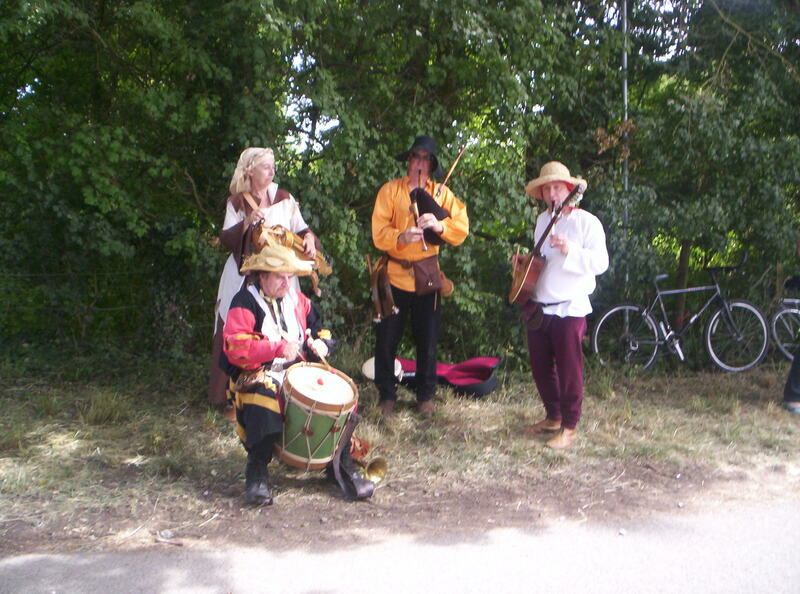 I introduced the proceedings – announcing the search for the Bard of Hawkwood (the contest will be held in a year’s time at the 2015 Open Day – as is the tradition, the Chair must be announced a year ahead). There will be an adult competition and one for children (5-10;11-15 yrs). The theme for the adults is ‘Flood’; and for the children ‘Summer’. It has to be an original song, story or poem 10 minutes or less. The adult entrants must provide a 300 word statement of intent, about what their plans would be if they won the contest. They would hold the title for a year and a day and be expected to fulfil that role with their bardic skills, e.g. writing and performing poems for special occasions. To qualify the entrants must be residents of the area (with a GL5 or GL6 postcode). I then invited up Richard Maisey to talk about the Chair and he read out a little of ‘What is Poetry…?’ Then I asked Sulyen Caradon, Druid of Bath, to lead us in Raising the Awen and reciting the Druid’s Prayer. Together we formed the Gorsedd of Hawkwood – whose job is to look after the Chair and organise the competition. Next up, was John Xzavian again to recite his satirical verse about poetry. He was followed by Mark Westmore, the new Bard of Bath, who belted out his Beltane poem. Then we had a trio of Stroud poets – Gabriel Bradford Millar, Peter Adams, and Robin Collins (who will hopefully enter next year as they’re all strong candidates). Richard and Misha Carder from the Bath Gorssed then offered their eco-poems. I followed with my ‘Song of Taliesin’ poem – honouring the Penbeirdd – and the Eisteddfod part of the ceremony was finished off by Jehanne and Rob Mehta’s beautiful ‘Corn King’ song. We finished the ceremony with the Blessing of the Chair, scattering it with water from the Hawkwood spring. I joked that anyone who won the Chair would become the Soggy Bottom Bard! Once more I encouraged folk to enter. Then John blew his horn and we processed out. Job done. The crowds on the lawn seemed entertained – many no doubt being exposed to a modern Bardic ceremony for the first time. Hopefully, some will be inspired to enter the contest. Stroud has plenty of opportunities to hone bardic skills, with the numerous open mics and workshops – Hawkwood College of course running a comprehensive programme in tandem with the Cotswold Word Centre. Budding bards have a whole year to sharpen their quills and practice their projection. Afterwards, catching my breath, I was able to grab a ‘bardic burger and beer’ and enjoy the sunshine on the lawn, chatting to friends and watching the May Pole dancing. It felt like we had successfully ‘warmed the Chair’ and announced publicly, in the ‘eye of light’, the competition. Until we get a winner I am acting Bard of Hawkwood and the Founder of the Chair. If no one comes forward I automatically become the reining Bard – but I hope we get plenty of entries. May the Awen flow and the best Bard win! This entry was posted in Bardic, Gloucestershire, Special Places, Spoken Word, Storytelling and tagged Bard, Bard of Bath, Bardic Chair, competition, Cotswolds, Eisteddfod, folk music, gorsedd, Hawkwood College, May Hill, poetry on May 6, 2014 by Kevan Manwaring. It’s been a busy few days, as everything seems to reach a crescendo towards the summer solstice on Tuesday. Wednesday I did an interview with Kate Clark on BBC Radio Gloucestershire, promoting my novel, The Burning Path. Later, I participated in the Stroud Prose Group, workshopping a chapter from a brand new novel project (after 9 years of following Isambard in the Underworld, a refreshing change). Friday I took part in Stroud’s Story Cabaret at the Hall, Five Valleys Project. Special guests were musician Matt Sage, and Armenian storyteller Vergine Gulbenkian. I performed my new locally-inspired story, The Heavens. There were fine contributions from the floor, including my friend Ola, up from Bath. Saturday I did my stint in the Spoken Word Assembly Rooms, recording folk who dropped by with poems for Stroud Out Loud! (SOL) the podcast I’m compiling with poet Adam Horovitz. In the afternoon I took part in a multi-media poetry workshop with members of Flash – a group of mainly Bristol-based performance poets performing later that evening in what used to be called The Space (in Stroud, things seemed to be named in such a way, eg The Field, The Hedge, The Shed :0). It was good to see something that was trying to push the envelope a little (between poetry, theatre, spoken word, 4-D art, etc) rather than playing it safe. A refreshing alternative to the Slam Slum. Sunday morning I blatted over to picturesque Burford for my friend’s private view – William Balthazar Rose is exhibiting in the Brian Sinfield Gallery there for a couple of weeks. It was nice to catch up with him and his family and friends – a contingent of Bath folk rocked up in a pretty Cotswold town. It was a flying visit, as I had to get back for a gig that afternoon – as part of Salam, an exhibition of photographs from Fez taken by local artist Marion Fawlk. Marion had invited me to perform some stories on a Sufi-theme. It was a very stylish event with a Moroccan oud player creating a magical ambience. A good crowd turned out for a Sunday afternoon – alot has been on over the last few days in the SITE festival, and its easy to get festival fatigue. I was starting to flag by Monday, but I had to host the Garden of Awen’s solstice extravaganza at the Star Anise Cafe. I summoned some sunshine from somewhere and made my way there in the pouring rain. We did intend to hold it in the courtyard but in the end we were crammed into the backroom. We certainly had a full house, with standing room only. We had a fabulous line of local and regional spoken word artists, including Helen Moore, Jay Ramsay, Rick Vick, Dawn Gorman, Karola Renard, Kirsty Hartsiotis and floor spots from the audience. Jehanne, Rob and Will got us all to sing along to some heartfelt songs with their band Earthwards – I offered quotations about light in the links – and the awen really flowed, like ‘liquid sunshine’ as Helen suggested. We certainly saluted the sun – and if it wasn’t up there in the sky, it certainly was in our hearts. This entry was posted in bard, Bard on a bike, Bardic Poetry, Britain, Extraordinary People, Extraordinary Places, Seasonal and tagged Adam Horovitz, awen, Burford, Cotswolds, creativity, Dawn Gorman, Earthwards, Flash, folk music, Garden of Awen, Helen Moore, Jay Ramsay, Karola Renard, Marion Fawlk, Matt Sage, motoribike, Poetry, Salam, SITE, spoken word, Star Anise cafe, story cabaret, storytelling, Stroud, Stroud Arts Festival, Vergine Gulbenkian, William Balthazar Rose on June 21, 2011 by Kevan Manwaring. I raced through the sunshine to be there in time for the opening ceremony performed by druid friends, including Elaine and Greywolf. Apparently, they had a countdown for me to arrive. I might have made it if not for the army maidens demanding a parking fee at the entrance – and me clumsily dropping my gloves several times. I parked up by a mobile home and raced in, over the tilting field and over the little wooden bridge that provides a threshold into the festival’s medieval timewarp. They said to meet my by the beer tent – typical druids. I saw a suspicious looking circle in the distance and headed towards them. Sure enough, the druids were in a circle outside the Drunken Monk Inn. I arrived and joined them just as they chanted ‘And may peace prevail throughout the whole world!’ They finished casting the circle with air – in the form of Greywolf’s flute; fire – with incense; and water – scattered before us. I pulled on my bardic cloak. Phew – I had made it! Elaine asked people to speak on behalf of whomever they wished to. Immediately, the PA kicked in, which made everyone laugh. The ceremony was good-humoured, especially with Greywolf’s light touch, and such disturbances didn’t derail things (indeed the success of any good ceremony is about being full present in the moment and opening to all). Heartfelt words were said about those fallen at the Battle of Tewkesbury – one of the decisive battles of the War of the Roses – that took place on the site, on 4th May, 1471. 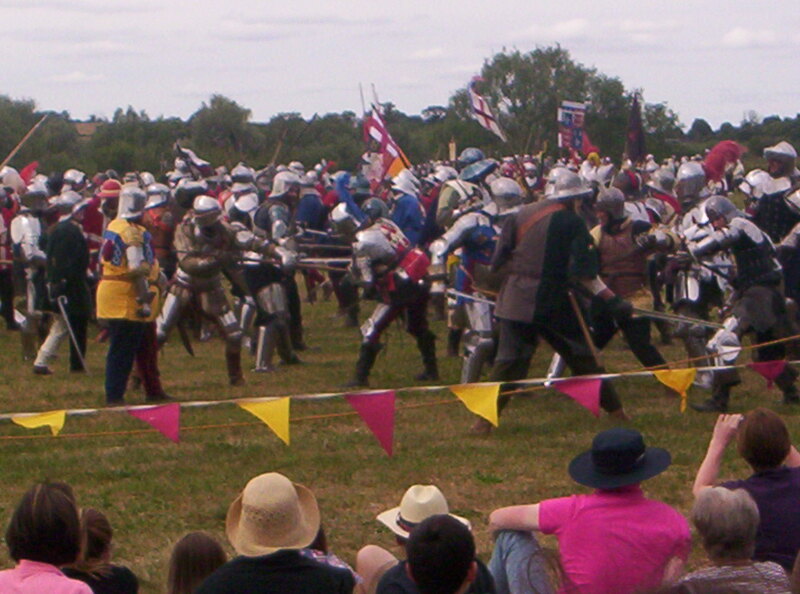 Around two thousand five hundred souls met their end that day – on what became known as the Bloody Meadow – more than the two thousand re-enactors that would recreate the battle later in the main arena. 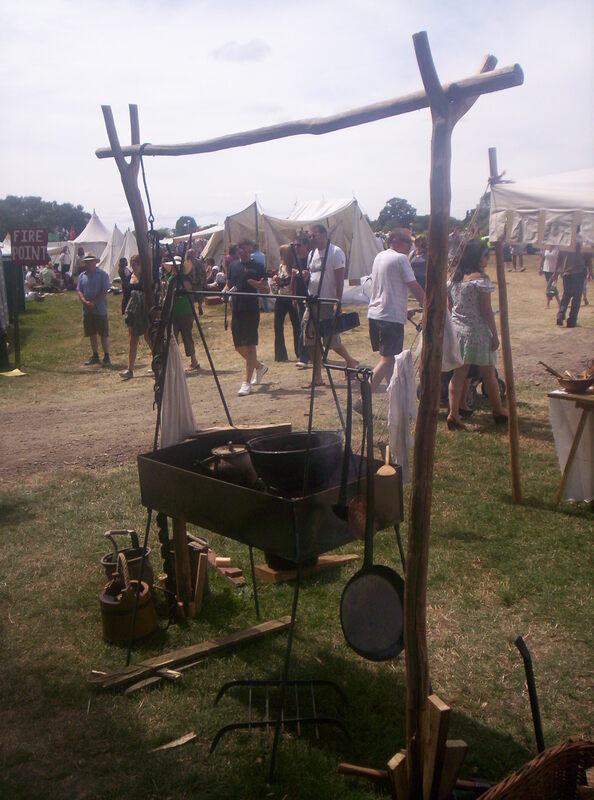 Fortunately, the festival was a far more peaceful affair, even though many of the stalls sold armour and weaponry. Strange how so much creativity and culture has thrived off the back of a slaughter. Warfare seems a peculiar thing to celebrate – but for many I imagine it just a chance to escape from the mundanity of their daily lives with a bit of dressing up and role-playing. Yet some take it very seriously – the cost of the costumes and equipment isn’t cheap. I wonder what draws people to certain periods – why do people re-enact? Is it a past life thing? a way of connecting with and honouring ancestors? or a form of OCD (as my friend Jay suggested later when we discussed it over a pint in the Woolpack in Slad, Laurie Lee’s local in the Five Valleys near Stroud)? It is easy to mock the likes of the ‘Sealed Knutters’ (members of the Sealed Knot Civil War re-enactment society, The Sealed Knot). I used to know one in Northampton who was a bona fide eccentric clearly born in the wrong century – a complete obsessive, with tankards and armour cluttering up his bedsit in a tower block – his great-great… grandfather had fought in the battle of Naseby and he still took it personally. But I can see how it gives those who participate a sense of tribe, of community. A reassuring idyll where everyone has a clearly defined role, and life is simplified to a village green arcadia – with all your needs met by individuals like the blacksmith, the baker, the brewer, etc. It is healthily low-tech but highly skilled – craftsmanship is highly prized. Things aren’t mass-produced by hand-made, often bespoke. When I had a chance to wander around the market – rows of stalls (offering a wonderful assortment of medieval wares and skills including alchemy; leech-craft; clayware for daily use; beautiful things in leather, velvet, ring mail; shiny feudal bling; wimples and snoods, doublet and hoseries, and the like) I was impressed by the sheer creativity and craft. It also occurred to me that alot of this is Peak Oil proof – and might be a glimpse of how society could be in the future (as imagined by Richard Jefferies in his post-apocalyptic novel, ‘After London’). However, I can imagine it not being so picturesque and bucolic. 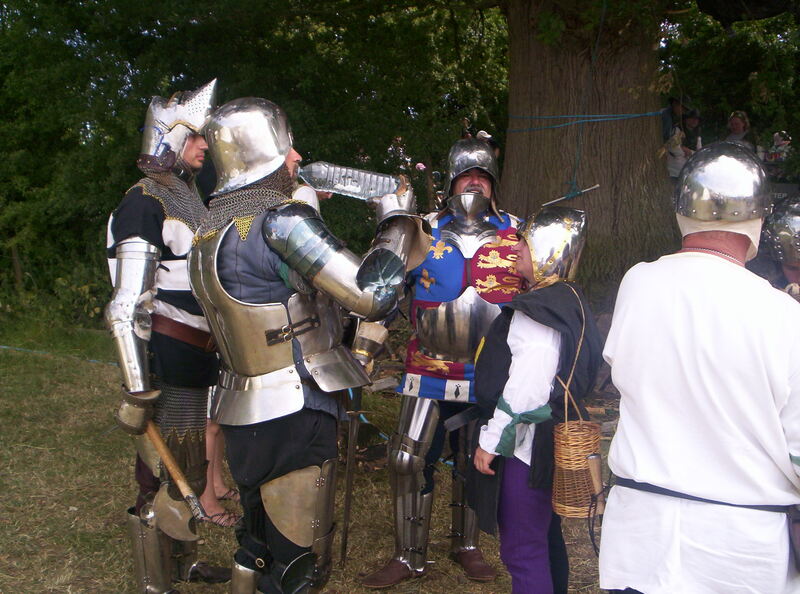 Folk lolled about in the sweltering sun (one of the hottest days of the year), enjoying a flagon of cider while watching ‘knight combat’ or listening to a band of prancing loons in the beer tent. There were a couple of guys were ‘pet dragons’ on their arms – but these were trumped by a man with a python wrapped around his neck, which he was letting small children stroke. I had to have a go as well. ‘Some pythons can be mean, but he likes people’, the owner reassured. There were lots of panting dogs around, tongues lolling (imagine sweating through your tongue – and then giving someone a sloppy kiss – eeeuww) including several large, shaggy wolf-like varieties. One husky pulled a small boy along in a cart – ‘it’ll all end in tears’, I said, seeing it running along. Next thing, it jack-knifed on a tussock, throwing the boy out. Fortunately he wasn’t hurt – indeed, seemed to enjoy the experience. Health and Safety seemed marvellously absent from the whole affair – although St John’s paramedics were there in force, especially for the final battle – where there services were required after one particularly rough skirmish resulted in an ambulance arriving. I watched an archery demonstration – just for a chance to lie back on a grassy bank in the sun. Far more impressive was the archery-on-horseback demo later, where Korean-style horsemanship/archery was shown in dramatic fashion by three folk dressed up like Mongols. The grand finale was spectacular – two thousands re-enactors marching onto the field of battle in all their armour and colours, waving their banners, shouting insults at the opposition. The crowds were encouraged to join in with this good-humoured ribbing. I ended up on the Yorkist side – not by choice, by chance – so I suddenly found myself a Royalist for the first time in my life. When the King and the Young Pretender finally met for parlez in the middle of the field, there was a certain frisson about the whole thing – enhanced by the commentary from the PA tower. It reminded me, visually, of Arthur and Mordred at the fatal Battle of Camlan – it seems this ‘script’ has been played out through time. The young will always try to overthrow the old and perhaps that’s healthy, as one generation must make way for the next. Yet there is something Darwinian and brutal about how the upstart, eager to prove himself, will try his luck against the established pro with his reputation (like an old stag – the alpha male – with his hinds, having to defend himself against a young rival). The battle slowly got under way – large armies don’t move fast: an unwieldly behemoth, once it gets lumbering in one direction, it’s almost impossible to stop. The chain of consequences led to the inevitable endgame, the slaughter of Bloody Meadow – men bashing the crap out of each other, rather than talking it out (a display of relentless stupidity – all violence is an insult to evolution, to the sacredness of life – I witnessed in microcosm with my friend later, as we sat on a bench in the churchyard where Laurie Lee is buried, opposite his favourite local, The Woolpack in Slad. A booze-fuelled altercation broke out, complete with screaming girlfriends, shattering the peace of a quiet Cotswold village on a Sunday afternoon). After watching about an hour of the ‘carnage’ – albeit with the Tewkesbury miracle of battlefield resurrection – swathes of arrows darkening the skies, the report of cannon and rifle fire, the shouts of men – I grew weary of it all. It’s sad that so much energy and talent is put into recreating death and destruction rather than the arts of peace. I’d had enough – it had been a full on weekend and I needed to rest, but there was still the ride home, via Stroud, where I met up with my dear friend Jay, for a heart-to-heart over a pint. We do not need to use our fists. We can be better than that. Jay shouted over to the brawling boozers ‘Stupid! Stupid!’ and there is something Neantherdal about such behaviour. 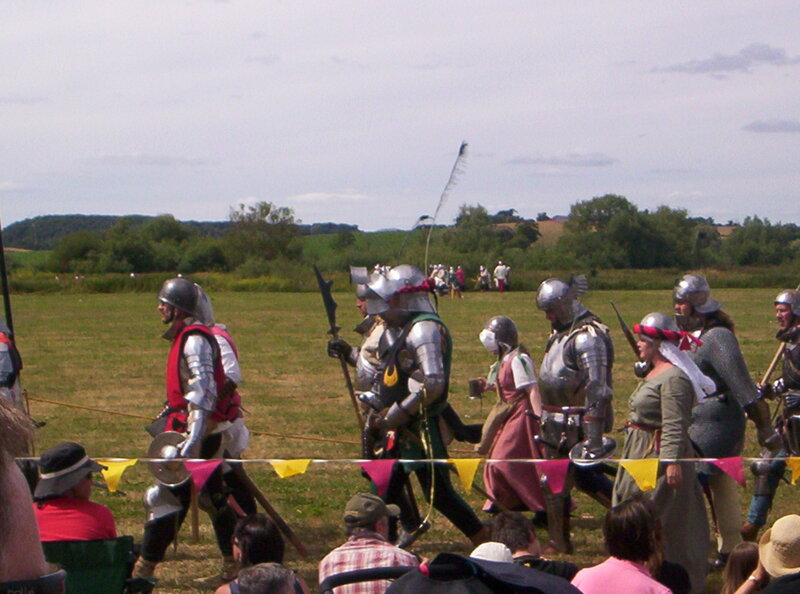 Yet, despite such reflections, it had been a worthwhile endeavour – the medieval festival in Tewkesbury is worth seeing. It makes for a colourful and interesting day out. It certainly brings history alive, which has got to be a good thing (for if we learn from the past there’s a chance we don’t make the same mistakes). We can take the best of it – the value of craftsmanship, of ‘human scale’ social structure and interaction, of etiquette, of community-belonging – and leave the rest. 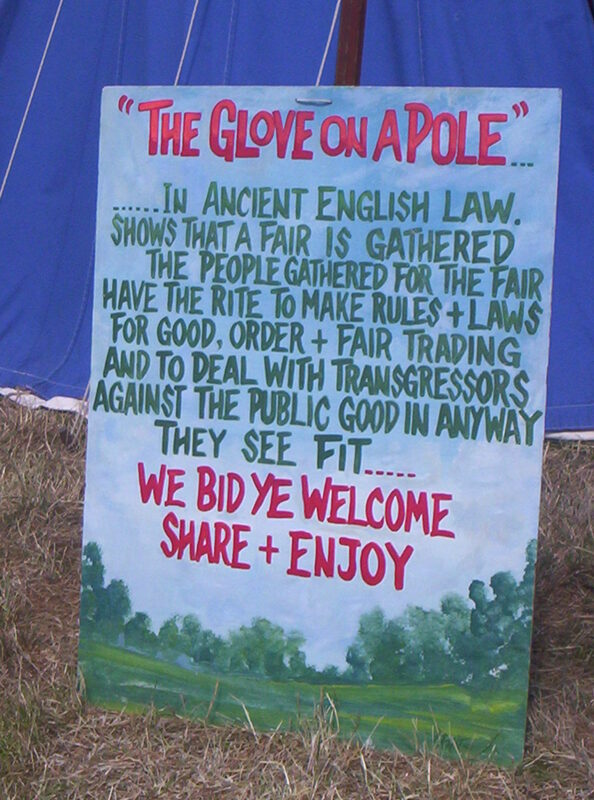 This entry was posted in bard, Bard on a bike, Britain, Extraordinary People, Extraordinary Places, Seasonal, Travel, Way of Awen and tagged ceremony, Cotswolds, druid, feudal, Laurie Lee, medieval, Slad, Tewkesbury Medieval Festival, violence, warfare on July 12, 2010 by Kevan Manwaring. The Manwaring Bros - together again! These petrification tales are common – typically, drunken revellers dancing on into the Sabbath and getting turned to stone for their disrespect, eg the Wedding Stones of Stanton Drew. Christian propaganda, perhaps, but good yarns! Feeling like I had imbibed a little of the cromlech’s ‘dragon energy’, I headed on – to the dirty old town. Northampton! Here, I visited my mum – checked out the progress on the garden and lent a hand, laying some lawn and planting a cherry tree. My sister turned up and we went for a couple down Dad’s old local, where they had put a plaque up at his corner of the bar. A nice gesture, despite spelling his name wrong! It was quite moving to see it and to raise a jar of his favourite tipple in his memory. That night I caught up with some old friends at the noisy dive that is the Racehorse. It had been a lovely sunny afternoon (if a little fresh over the Wolds) and J, me old mate, had it in his head it would be good to sit out in the garden. Unfortunately, by the time we got there (picking up his mum on route!) it was dark and … freezing. There was an impressive brick chimenea roaring like Dante’s inferno – which made me comment: ‘I always thought Northampton was a gateway to Hell and now I know!’ The various goblin-like denizens – pierced, tattooed, spiked, shaven, studded – hunched over their various poisons, polishing their cynicism, did not dispel the illusion. The Racehorse hasn’t changed since I used to go their as an art student in the late 80s. It’s where old Goths go to die. The freezing night forced us inside, where our eardrums were bombarded by deafening drum ‘n’ bass, making conversation in a group impossible (which renders the whole point of being in a pub, well, pointless in my humble opinion). To find respite from bleeding eardrums, one had to stand outside and freeze – only to risk passive cancer from the smokers. So much for ‘fresh air’. I realised I wasn’t enjoying myself by this point and decided to leave…I must be getting old. The next day more than made up for a disappointing evening. A walk over Delapre Abbey always straightens me out – it did as a kid growing up there, and it still does. It is my oldest sanctuary. I checked on the progress of the Dad’s tree – and new leaves were growing on it. And the gardens were in their Springtime glory. I ‘stood and stared’ in my grove, letting it work its quiet magic. the familiar groove spiralling inward. playing with me still in his paradise. the boypuppy who became a wolf. but unable to share its bliss. a Jack-in-the-Green, without knowing why. naming them octopus heart monkey. I gleaned an inkling of the Muse. I silently communed, vertebrae to bark. keep the world at bay. After doing some work on the garden, I bid farewell to mum, and headed south – deciding to risk a visit to my ‘long-lost’ brother, now residing in Buckinghamshire just down the A43. I hadn’t seen Gary for about seven years – and even birthday and Christmas cards had dried up. I don’t know why – because we always got on okay. It saddened me to think I had a brother in the world who didn’t acknowledge me and I decided to do something about it. I had tried to ring that morning but got no reply and so, somewhat nervously, I decided to risk just dropping by. As it was still early and I hadn’t eaten lunch I made a beeline for Jack’s Hill Café first, just outside Towcester on the A5, a famous biker greasy spoon, where they were having a ‘Ton-up Day’. The carpark was looking healthily full of mean machines as I turned up on my humble Zuki. A Stones-sounding and looking rock band (The Rocketeers) was playing in front of the café and there was a nice vibe. I got me a ‘biker’s breakfast’ (albeit a veggie variety) and sat down to soak up the oil and grease. Luvverly! Slurping down my cuppa, I wandered around, checking out the big bikes and the couple of stalls – one about the charity, Riders for Health, and the other, promoting Riders’ Digest (which I thought might be interested in a page from Bard on the Bike). A raffle ticket and a promo copy later, I sat on my bike and listened to the second set of the band – bluesy Americana – before heading off to find my brother’s place. Amazingly, I found it – a tiny hamlet in the middle of nowhere. Fortunately my mum had shown me some photos of the place the previous day so I recognised the house as I rode past it. I pulled up in the layby in front of their house, just as my brother was coming out of the house. I thought he had seen me, but when I flipped my helmet up and called out ‘Hello!’ he politely responded and carried on pottering in the garden. I found out later he thought I was just another walker – they’re used to ramblers parking there. Like Odysseus, returning after twenty years I was not recognised by my own relative. And so I got off the bike, pulled her up onto the centre stand and lock the front wheel, before approaching the garden. Gary was just out of sight, putting some bread out for the birds – and I poked my head around the corner and said: ‘Would you be my brother?’ He finally recognised me and held out a hand – but I gave him a fraternal hug. This was a big moment for me. Here, in front of me, was my brother, looking so … solid, with his black beard and mature Clooney-esque looks. Seeing a sibling, especially one of the same gender, makes you feel more real somehow. You are not alone in the world. Another shares your genes. It’s a powerful feeling. A little awkward at first, but not unwelcoming, he showed me his impressive vegetable patch. It turns out he has green fingers. Clearly he has ‘put down roots here’, and I can see why – a lovely place far from the madding crowd. He invited me in and we slowly, hesitantly caught up. His partner, Lisa, finally arrived – she had wondered why Gary had invited a ‘stranger’ into the house! I wasn’t a stranger, I was his brother … but it had been too long – we were practically strangers – and we had a lot of catching up to do. More than was possible in my brief visit – the kick-off of the big game was within the hour, which somewhat curtailed it – but the main thing was the ice had been broken. Lisa’s son was introduced, a nice lad called Jay. I think I won him over with one of my muffins. Lisa made us a much welcome coffee. Gary and I swapped emails – a good sign. Before I left we had a couple of photos – evidence! Look, I have a brother! And hopefully Gary won’t forget he has one now. I am happy for him – he has a nice house, partner, step-son, is doing well in his job (lucky to have one in this current climate). He’s just got on with his life and I can’t blame him for that … but the old call or card wouldn’t have gone amiss! Don’t be a stranger, bruv! I’ve missed ya! Still I left glowing with happiness – and had to stop at the next village just to assimilate the experience. Composed, I carried on my way – taking a short-cut along a B road to cut out Banbury, passing thru the picture postcard Deddington. I stopped off at Ma Larkin’s, another café popular with bikers (several were parked up, also out enjoying the rays) for a galvanising cuppa for the road and then headed back down the Fosseway into the setting sun. When the weather’s with you, there aint nothin’ better than riding on two wheels. I was enjoying myself so much, blatting along, I decided to take an impromptu ‘alternative route’ back, turning right at Cirencester – taking the lovely Minchinhampton Valley into Stroud and calling in on my friend who has a stunning place on the edge of the Cotswolds … but that’s another story. This entry was posted in bard, Bard on a bike, Bardic Poetry and tagged brother, Cotswolds, Delapre Abbey, folktale, Jack's Hill Cafe, Ma Larkins, Northampton, Rollrights, two wheels on April 29, 2009 by Kevan Manwaring. When the snows cleared a couple of weeks ago the snowdrops were there. They had already raised their timorous heads before this Cold Snap and had survived its harshness, despite, or maybe because of their small frailty. Too insignificant to be noticed by the frost giant? The snow gods? And yet easily trod underfoot. At the weekend I met up with a friend at Nympsfield long barrow, high up on the Cotswold escarpment overlooking the Severn plain. Returning for tea and cake to her lovely cottage, similarly situated, we passed a country churchyard at Edge filled with white flowers amongst the stones. Life determinedly returns, however transient, though its roots cling to mortal clay. Something makes it grow, despite its brief life. Or perhaps because of it. It feels the impulse more urgently. Every day is more precious, sweeter the dew. Whatever may have befallen us in the past, whatever ‘slings and arrows of outrageous fortune’ it is hard not to feel some sense of renewal, of a new chance, with the virgin year before us. All things are possible on its tabula rasa. Snowdrops are a symbol of that most precious commodity, hope. In these bleak times, when the economic house of cards crashes down around us, it seems foolhardy to be hopeful and yet more imperative than ever – if we are not succumb to the riptide of gloom. In a speech made by President Obama in the light of the economic crsis, the Guardian said that ‘he has undammed the springs of hope.’ (‘The Springs of Hope’, Guardian, 26.02.09) If we listened to the news every day, with its tales of ‘toxic debt’, banks going bust, big firms going under, fat cat payoffs, nuclear folly and celebrity cancer, it would be hard not to surrender to despair. But nature quietly, insistently, tells us, not to give up. That the world will keep turning whatever we do to it, or ourselves. To feel better, all one has to do is walk out into the garden of Spring and enjoy the morning of the year. The world is still beautiful. 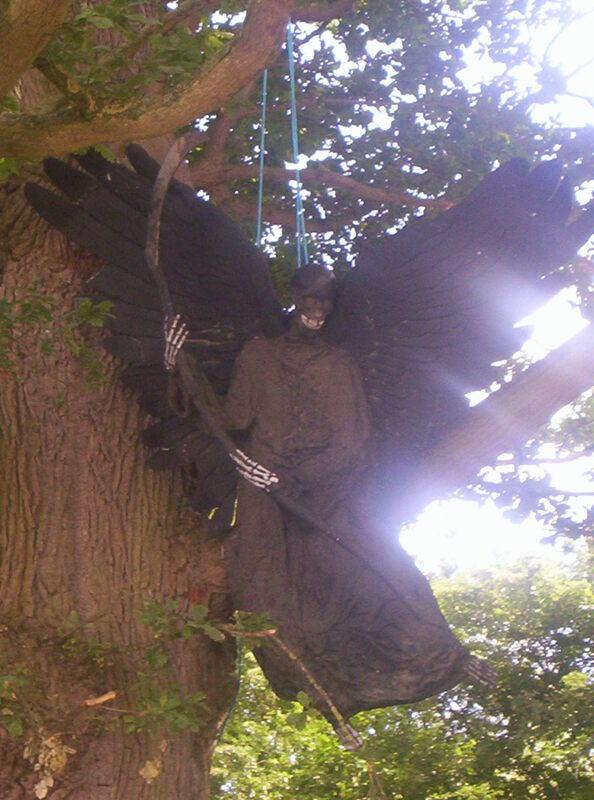 This entry was posted in Bardic Poetry and tagged Cotswolds, Death, hope, life, Obama, rebirth, renewal, snowdrops, Spring, winter on February 27, 2009 by Kevan Manwaring.